Q: What are the costs of residents’ parking in Cambridge? A: Residents’ parking schemes are self-funding, ie they are costed to pay for themselves. 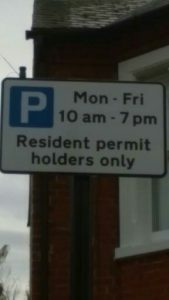 At present, participating in a residents’ parking scheme starts at just over £1 a week per permit. There are discounts for less polluting vehicles. Each household can buy up to three permits. Schemes that include weekends and/ or evenings are more expensive than ones running 9-5 Monday to Friday or less. There is usually a joining fee to cover set-up costs but the Greater Cambridgeshire Partnership is currently funding these. A: Residents may purchase up to 20 visitor permits a year, which allow visitors to park for up to 5 days at a cost of £2.40 a day or part of a day. Anyone living in the area of a scheme can apply for visitor permits for their guests. You do not have to have a residents’ parking permit to have a visitors’ permit. Businesses can apply for permits. Blue badge holders are entitled to one free annual visitor’s permit. Q: What happens if I have carers or medical visitors who need to park? A: There is a free medical permit scheme for people who need visits from relatives or health professionals. Your doctor will need to assess your infirmity or lack of mobility and provide an estimate of the number and frequency of official visits required. There are dispensations for medical professionals who attend emergencies or who carry special equipment. Q: What happens if I have people working on my house who need to park? A: Tradespeople are able to purchase one or two permits for the area in which they are working. Q: What about shops/ schools/ churches? A: It is possible to include short-stay bays for community facilities as part of a scheme. They should be incorporated at the time the scheme is developed. Q: Does a residents’ parking scheme guarantee a space? A: It does not guarantee a space, but it gives residents a better chance of getting a space. Q: Do you have to join if there’s a scheme in your street? A: Only if you want to park in one of the on-street residents’ bays. If you have your own private parking, say on a drive, you need not purchase a residents’ permit. Q: To whom should I report illegal parking? A: Ring the County Council’s Civil Enforcement team on 01223 727 900. For dangerous parking, eg obstruction, parking on school zig-zags, or in bus lanes and cycle lanes, contact the police on 101. Q: I am in a car club. Surely I would not have to pay £50+ a year when I only park in the street occasionally? A: Residents who occasionally use car club vehicles can purchase visitor’s permits, or use the Pay & Display or short-stay bays if they are close enough to be convenient. Some schemes include spaces specifically for car club vehicles. See the County Council website for more information including application forms for permits, and the residents’ parking policy. As a resident of Morley area, I would be interested to know what the situation is for a resident (such as myself) who does not own their own car, but uses a Car Club (Zip Car) As such, I might want to occasionally park one of the car club cars outside my house, often for loading and unloading, however it might be for longer periods, say for about 1 hour. Buying a residence permit would be extremely unfair, and would penalise behaviour that makes the parking situation better than it would otherwise be. Nor is it practical; I can book one of a number of different cars, and the car club rotates cars on a regular basis. So how could I legally park during resident restricted periods ? As a general comment, the streets would be much improved by greater usage of car clubs, it would be nice to see their use encouraged. Dear Phil. The Council’s parking manager has confirmed to me that people who use car clubs would be allowed to buy and use visitor permits for car club vehicles. Thanks for your question, Phil. May I just say that I am pleased to hear of somebody round here who uses a car club, as it is a good solution to having a vehicle for occasional use. I have asked the car clubs if they will provide a car club point in this area but no luck yet. To answer your question, I think the answer would be to use one of the short-stay or Pay & Display bays that will be included in the parking plan, but I will run this past the Council and see if there is any other provision. Thanks for the response. I would just say that, I think, the majority of Car club uses (especially those that require parking near your own residence) will involve fetching or carrying loads that can’t be managed by cycling or using the bus. My own supermarket shopping habits, for example, have evolved into a heavy shop every two months or so by car, where I stock up on bulky non-perishable goods, interspersed by weekly cycling trips for fresh produce. – The point being, of course, that the only occasions when I really want to park a Zip Car outside my own home is when I have lots to load or unload. The fact that you book a car for a period of time also means that I tend to do “batch up” loading jobs, so I might book a car to do a large supermarket shop, buy plants from a garden centre and take some stuff to rubbish dump. If the short-stay bay is down the other end of the street (for example) then clearly that makes life inconvenient (and penalises my good behaviour) even if it means I would have to do this sort of thing at a time when the parking restrictions were not in effect. Further to this, I completed the on-line survey for the county council, which includes a mention that I had discussed with you. 2. Does not provide me with a copy of my answers. Thanks Phil. I too have asked how car club users would be accommodated – or in fact anyone who hires a vehicle occasionally. I’m thinking that buying visitors’ permits might be the answer,even though it’s the vehicle that is the visitor, not the driver. It will be of relevance in other areas apart from ours, so worth finding the right answer. Thanks for your other points too — I agree, and sorry I didn’t spot the first one myself. Hi, My ill elderly mother lives in the proposed Romsey resident parking area. My sisters and I take turns in caring for her, We all have our own cars and spend a couple of days each at hers. What would be the best way for us to participate in this scheme? Does the visitors parking permit restrict it to one car or could it be passed in another. How would we apply for it and get it? Or would she be able to have a residents parking permit that would cover all of our vehicles? Otherwise its just another ‘Tax’ on families who have regular visitors. For example I am often called out to my mother (as i am principle carer) during the night. If I haven’t got a permit what am I supposed to do. I am also a blue badge holder and cannot walk far. Why such a large increase in Visitors permits, when it is only less than £1 per week for residents permit? Visitors permit which my family would require to look after my mother would costs us at a minimum of £876. I presume these visitor parking permits would not be interchangeable between vehicles? Hi Neil. I think that there has been a problem in some areas with so many visitor permits that residents cannot find spaces, so it’s an attempt to balance it out. People needing visits for care reasons can get free permits for those who provide the care — please see https://www.cambridgeshire.gov.uk/residents/travel-roads-and-parking/parking-permits-and-fines/parking/residents-parking-in-cambridge/. Blue badge holders can park in residents’ bays whenver they wish.